I looked at three games for load time performance and I picked these titles because they run the whole spectrum of how well an SSD will work in a gaming machine. First up is Spore. You'll see that the results are pretty much the same on all of these drives, we're reading from the disk but we're bound elsewhere in the system - an SSD won't do anything for you here and there are many games where you won't see improvements in load times. 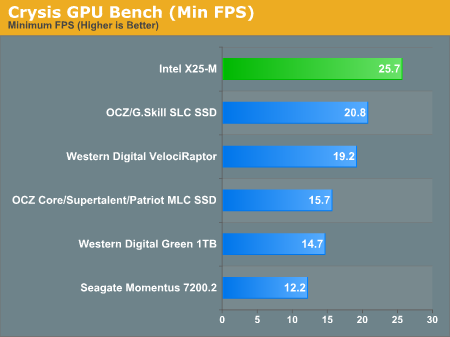 Compared to notebook drives, the SSDs do extremely well. Against the 3.5" competitors, the margins are smaller but there - you shave a couple of seconds off of the VelociRaptor's time, more off of the 1TB WD drive (or any other 5400RPM drive). For some reason these sorts of performance gains are far less noticeable in real world usage than the improved application launch times. Perhaps it's because when you're playing a game it's all you've got going on and you're more patient, whereas when launching a web browser or an application you're trying to complete a task where time is more valuable. I'll refrain from any more psychological analysis and stick to the drives though. Finally we get to Crysis, and this is the other end of the spectrum because Crysis is a game that is very demanding on the I/O subsystem. We've got three results here: 1) How long it took to launch the game and load the benchmark level, 2) Minimum FPS, 3) Average FPS. I'm only reporting the minimum and average frame rate of the first run, because in that run of the benchmark the textures and level data are still being streamed off the disk and it actually impacts both minimum and average frame rate. 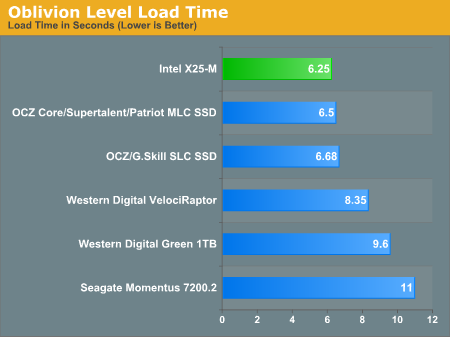 The Intel X25-M manages to load the game and benchmark level in around 80% of the time of the VelociRaptor and about 90% of the time of the Samsung SLC SSDs. Compared to notebook drives the performance advantage is staggering. Game load and level load performance can be improved and Crysis is a good example of that. The minimum frame rate graph is very interesting because it shows the impact loading textures from a slow disk can have on minimum frame rates in a game. The Crysis test is a bit exaggerated since it's streaming data as fast as possible, which you don't always do in a game, but if you've ever felt your game grind to a halt and hear your disk thrash this is a good test of that. The X25-M has a 33% advantage here over the VelociRaptor, and I won't even mention the utter destruction of conventional 2.5" HDDs. 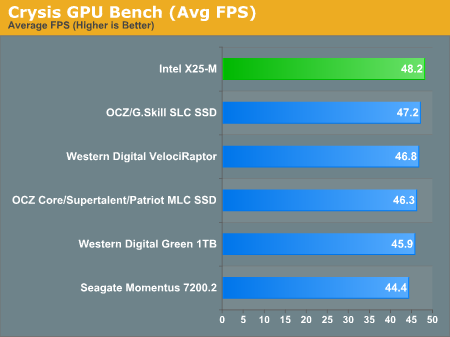 Compared to other SSDs, the Samsung SLCs come the closest but Intel still manages a 25% advantage. 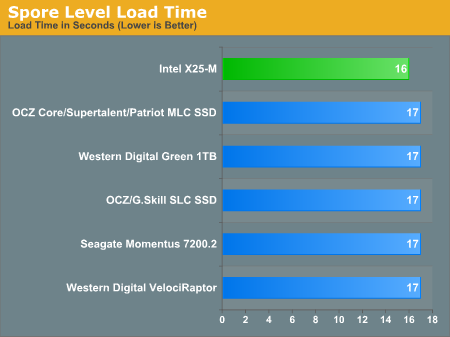 The JMicron based MLC drives suffer terribly here, Intel's MLC drive is 63% faster. I will also point out that for a couple of runs the JMicron MLC drives managed a minimum frame rate of 3 fps, several of those lovely pauses happened in the middle of the benchmark which really changed things. The phenomenon was random enough that I reported the more common frame rate but it's worth pointing out that the pausing issue can happen while gaming, which would be bad if you're playing any sort of multiplayer game. Average frame rate is obviously affected, but you can see that the numbers are much closer indicating that the minimum frame rates are at least not sustained for long periods of time. What can we conclude here? SSDs can be good for gaming, but they aren't guaranteed to offer more performance than a good HDD. And where SSDs do offer an impact on gaming performance, Intel's X25-M continues to dominate the charts.